LANSA Open for .NET allows developers to write .NET applications that take advantage of resources on the IBM i (System i, iSeries or AS/400) without leaving Visual Studio. It is a Visual Studio plugin that gives .NET developers the means to incorporate IBM i services (including data and programs) in Windows desktop and web applications. The developer views the IBM i data and programs as resources within Visual Studio. What is LANSA Open for .NET? LANSA Open for .NET consists of the LANSA Visual Studio plugin, the LANSA Business Rules Engine and a runtime DLL. 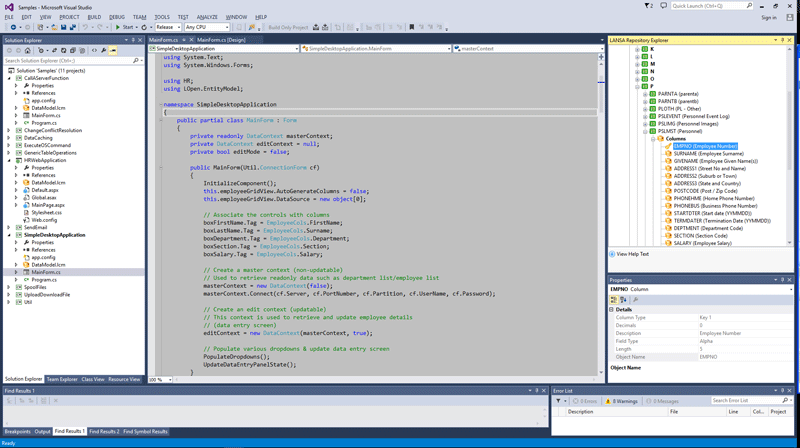 The LANSA Visual Studio plugin includes a class library, Repository Editor and Data Model Editor. The LANSA Metadata Repository provides a central point for business rules and the runtime DLL manages secured communications between the .NET applications and the IBM i server. Developers working with Microsoft Visual Studio can use IBM i objects in their .NET applications. The objects available are database table schemas, data definitions, validation rules, business logic algorithms and multilingual text (field labels, headings and help text). Developers access the objects using the Repository Explorer and Data Model Editor supplied with LANSA Open for .NET. For example, to view the schema and content of tables in databases, .NET developers, working from within Visual Studio, use the Repository Explorer to inspect the database objects in the LANSA Repository. With LANSA Open for .NET developers working with Microsoft Visual Studio can use IBM i objects in their .NET applications. The Repository Explorer and Data Model Editor operate like any other .NET provider in Visual Studio and include IntelliSense support. Developers prepare a data model for their application from database tables defined in the LANSA Repository by dragging objects from the Repository Explorer and dropping them on the Data Model Editor. Saving the data model will generate the .NET classes and methods that will access the tables on an IBM i server from the .NET application. An IBM i or LANSA administrator can also create data models for use by .NET developers, using the standalone version of the Repository Explorer and Data Model Editor. .NET applications written with C# or Visual Basic, or potentially any Common Language Runtime (CLR) compliant language, can use the Repository Explorer and Data Model Editor included in the LANSA .NET provider. .NET applications use the same business rules already defined in the LANSA Repository. Not having to duplicate business rules in each .NET application will increase developer productivity and reduce the ongoing maintenance effort. The LANSA Open for .NET runtime DLL is deployed as part of your .NET application. The LANSA Open for .NET runtime DLL is deployed as part of the .NET application and provides secure encryption between the Windows and IBM i platforms. Through its data access discipline, security and performance, LANSA’s Repository protects the integrity of data for thousands of companies using IBM i servers worldwide. LANSA Open for .NET allows .NET developers to use these same features. By storing enterprise business rules centrally in the LANSA Repository, RPG, COBOL and .NET programs can be subjected to the same validation constraints. The results are zero duplication of source code for business rules, tighter security, faster performance and cleaner, more reliable data for IBM i organizations. Just about every non-LANSA application contains source code that validates data before it is inserted, updated, or deleted in the database. Even though these rules are critical to safeguarding the integrity of enterprise data, they are often duplicated in multiple programs. Not only is this a maintenance nightmare, but it can also introduce validation variations and application inconsistencies. In LANSA, business rules critical to enforcing data integrity are stored centrally in the LANSA's Metadata Repository rather than in the database or application. This locks down system-wide validations, calculations and other business rules by delivering a completely independent data services layer that governs all database access. With LANSA’s Repository, these business rules, algorithms and calculations reside centrally within the repository and are not duplicated and sprinkled across many programs. Changes only need to be made once to these business rules, algorithms and calculations and do not require the client programs to be recompiled or redeployed, whether the client is a .NET or IBM i application. Using LANSA Open for .NET, developers have access to IBM i server functions including programs, spooled files, message queues and operating system commands. They can write programs that inspect spooled files, issue operating system commands, start programs and use message queues. For example, data queues on the IBM i server provide messaging services for program-to-program communication. Developers can write .NET programs that use these same messaging services. A program running on the IBM i server and a .NET program can work collaboratively by sending messages to each other via data queues. This simple integration architecture can help to automate business processes across the Windows and IBM i platforms. Using the LANSA .NET provider for IBM i, developers have access to enterprise business rules stored centrally in the LANSA Repository and IBM i server functions. .NET applications built using the LANSA .NET provider, allow IT departments to safely open up their enterprise data to a variety of internal and external applications without risking security or data integrity. Completely eliminate the need for database synchronization and provide a single version of the truth to users as .NET and IBM i applications operating independently can now use the same enterprise data. LANSA Open for .NET implements native record-level access over an encrypted, secure connection. Using native record-level access means .NET applications that work with large volumes of DB2 data will perform faster by taking advantage of the IBM i's powerful data processing capabilities. LANSA Open for .NET’s runtime DLL encrypts and compresses data during transmission between the client and the server, protecting sensitive data from being compromised as it is sent down the wire. These features enable packaged software vendors and in-house development teams to securely and quickly update IBM i information from .NET applications. IT managers have found it challenging to manage siloed development teams and multi-platform projects because there hasn’t been an effective way for mixed development environments to share resources. When .NET developers use the LANSA Visual Studio plugin, RPG, COBOL and .NET developers can all reuse the same enterprise business logic, validation rules and calculations within both .NET and IBM i applications. Reuse removes the need to duplicate business logic, validation rules and calculations within in each application, speeding up both ongoing application maintenance and development of new applications. IT managers can use LANSA Open for .NET to break down their development silos, share enterprise wide business rules and resources across all development environments and improve the speed and quality of application development. Microsoft provides tools for publishing web services that companies can combine with LANSA Open for .NET to expose the data and services running on an IBM i as web services. There is no need to implement the IBM web service infrastructure on the IBM i. The web services will use LANSA Open for .NET to retrieve data and/or execute programs on the IBM i and return the response to the web service. Suppose you wanted to include an order entry form in a website or a SharePoint portal. The web service will collect the order data from the web form and pass the data to LANSA Open for .NET which will run the order entry program on the IBM i to insert the data. This architectural approach provides you with the capability to extend the reach of your line-of-business systems while protecting the databases that manage them. Reduce the cost of publishing web services from IBM i systems by implementing the web services on the Microsoft platform combined with LANSA Open for .NET to expose the functionality and data from the IBM i systems. Why use LANSA Open for .NET? After new applications are deployed they are subject to continual modification and extension. Centralizing the business rules and accessing them from .NET applications means not having to code the business rules in any .NET program. Only having to change the business rules once in the repository, when change is required, means less cost, less time and less risk. Business rules centralized in the LANSA Repository are independent of platform and database, allowing your .NET programs to access different server types and different databases without changing any code. LANSA Open for .NET enables IT departments to safely open up their enterprise data and applications to a variety of internal and external .NET applications without risking security or data integrity. IBM i organizations with hosted .NET websites can now tightly integrate them with the data and business processes on the IBM i server to deliver a better customer experience. Completely eliminate the need for database synchronization and provide a single version of the truth to users as .NET and IBM i applications operating independently can now use the same enterprise data. The LANSA .NET provider gives developers flexibility when building the presentation layer for business applications. You can now choose .NET development tools to build the user interface. For ISVs with applications built on the LANSA platform, LANSA Open for .NET enables the extension and enhancement of these applications by .NET developers. ISVs can use the LANSA .NET provider for IBM i to develop .NET add-ons for their application. Even their customers can use the .NET provider with .NET development tools to extend or enhance the application and they don't need to understand or even be aware of the underlying technology used to build the application. Following the footsteps of other LANSA products, LANSA Open for .NET is easy to use and implement for .NET developers. The class library is shipped with ready-to-run samples in both the C# and VB.NET languages. There is almost no learning curve for .NET developers. No knowledge of IBM i, DB2, or LANSA is needed. No additional LANSA software needs to be installed on the .NET client system. If you already use Visual LANSA, all you need is Microsoft Visual Studio, the LANSA Open for .NET DLL and the online documentation. Nothing else is required. If you are not already a LANSA development site, you will need to identify and train a LANSA Repository Administrator to administer the LANSA environment on the server. The rest of your .NET team only needs the LANSA Open for .NET class library and documentation. Your whole team is now ready to start using LANSA Open for .NET. Opens up the IBM i data and applications to .NET developers in a productive and safe context while enforcing data management discipline. LANSA Repository Explorer and Data Model Editor – access to the LANSA Repository from within Visual Studio. Data management discipline is enforced by centrally stored business rules and functions, including data validations, error messages, referential integrity, database triggers and derived (or virtual) fields. Productivity is enhanced by removing the need for the inclusion of business rules and data validation in the .NET applications. Call programs on the IBM i including LANSA functions and programs written in RPG, COBOL or Java. Invoke IBM i server functions from C# or Visual Basic programs. Maintain (create, update, delete) databases on the IBM i from .NET programs with business rules enforced at the database. Supports access to multilingual and DBCS services provided by the IBM i. Faster and more secure than ODBC. Unlike basic table I/O applications, all client applications are automatically subjected to rigorous IBM i security checks, data validation and referential integrity checks. Secure encryption between the Windows and IBM i platforms using industry standard DES or Twofish. Full .NET CLR verifiable class library – LANSA Open for .NET is not a class library front end to a non-CLR compliant WIN32 application. No knowledge of LANSA required by .NET developers. They only need to become familiar with the services provided by the class library and the LANSA .NET provider. Small footprint – deploys as a single DLL within your .NET applications. Standardized error handling, tracing and diagnostic capabilities. We are impressed with the LANSA Open for .NET response time, specifically to access the ScoopSoft solution.